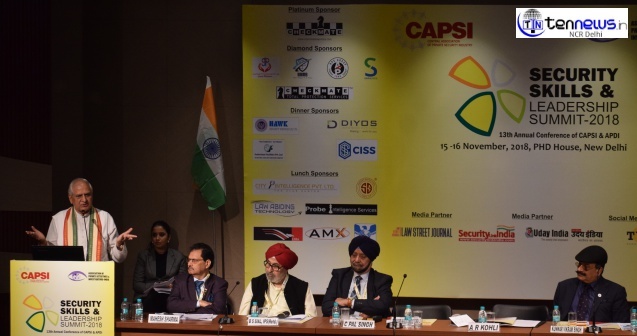 Remarkable workers in the field of manpower awarded at "Security Skills and Leadership Summit 2018"
New Delhi: Central Association of Private Security industry and Association of Private Detectives and Investigators launched their 13th Annual Security Skills and Leadership Summit at PHD Chamber of Commerce and industry (PHDCCI) . A large array of eminent dignitaries including A R Kohli, Former Governor of Mizoram; Sharad Yadav, Former Union Minister and Shahnawaz Hussain, Former Union Minister graced the event. The two day conference was organized with the aim to discuss welfare and development issues related to the Private Security Industry. The event was inaugurated in the traditional manner by lightening of lamps followed by welcome address by the Chairman who gave out a broad perspective of important issues being faced by the Private Security Industry (PSI) today.